Kent Valley Ice Centre, Kent, WA., Thursday, September 13, 2018 - Kent Valley’s 2018-19 Learn to Play (LTP) program was overhauled earlier this month to provide three 8-week sessions per year. The first session under this new format gets underway Sunday, September 23rd for an 8-week run and a cost of $152. On the 8th week of the program the skater/player will be evaluated. This evaluation will determine if the skater/ player is ready for the next level of LTP hockey, the Mini-Mite division or a full-fledged recreation team. Gear rental is available through Kent Valley Ice Centre for $80 per 8-week series, plus a $100 security deposit which is refundable once gear is returned. The Kent Valley Hockey Learn to Play program focuses on skating skills, but also teaches the basic skills of stick-handling, shooting and passing. 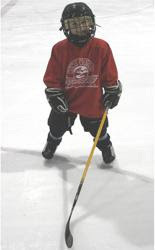 The Learn to Play program is done in full gear, and players experience the thrill and challenges of trying to skate, use the stick, and handle the puck simultaneously. The LTP Program is available to beginning level boys and girls ages 4 to 10 years old. KVHA’s hockey coaches are certified through USA Hockey for coaching at the appropriate level. Most have previous playing and coaching experience, many with college, junior and professional experience. KVHA members are encouraged to watch their team’s ice schedule over the next few weeks as they are subject to adjustments on short notice. Mark your calendar now! Kent Valley Hockey’s team photo night is set for Monday evening October 29th. Team and individual photos will be taken. A full schedule of the night’s activities will be published as we get closer to the actual event. Click here to register. 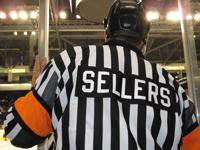 The link will take you to the USA Hockey web site, Officiating tab and Seminar Registration page. Please feel free to contactpshoa.admin@gmail.com if you have any questions or desire further information. The long-awaited shooting station in the Kent Valley Ice Centre’s Fitness & Training Centre is operational this week. Full details on its use, operation and pricing will be announced soon. Stay tuned! Kent Valley’s 12U PeeWee Selects team is raising funds for the benefit of one of their own, a hockey mom suffering from oral cancer. The team has several fund-raising projects underway. First, the team is selling tickets to the October 26th Seattle Thunderbirds game with the Kamloops Blazers at accesso ShoWare Center. The team has priced the tickets at $75 each to maximize the amount available for the team’s fund-raising effort. The team is also promoting the Oral Cancer Foundation’s “Washington Walk” on September 22nd at Juanita Beach Park in Kirkland. KVHA members are invited to join team members to learn about oral cancer and make a difference! Online registration closes at 12 PM on September 21, 2018. After this date please register in person the morning of the event with cash/check/money order made payable to The Oral Cancer Foundation. The first 200 walkers on-site will receive a free OCF bag! Click here for full details and registration.